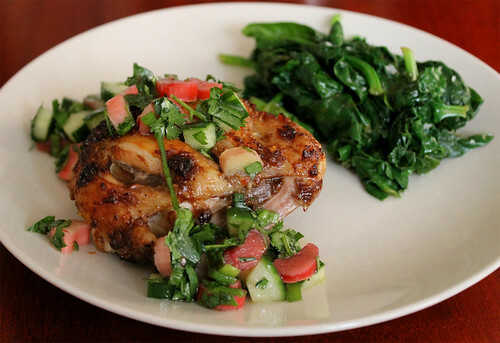 However, I decided to take some of my rhubarb and use it in a savoury dish, and when I came across a recipe for Spicy Chicken Thighs with Rhubarb-Cucumber Salsa, I knew I had a winner right there. I love how ridiculously easy this dish is, perfect for a busy weeknight, but still pretty and impressive enough to wow your guests at your Saturday dinner party. The sauce/marinade calls for only a few ingredients, most of which you’ll probably already have in your pantry and fridge. To get even more flavour into your meat, you could even marinate the chicken overnight in a Ziplock bag—all you would have to do when ready to eat is roast them and make your salsa. My favourite thing about this dish (besides how delicious it is)—the colours! It’s an absolutely eye-catching dish, with the crispy golden-brown of the chicken skin, and the vibrant greens and reds of the salsa. Who wouldn’t want to eat this just looking at it? The marinade did add a lot of great, savoury flavour to the chicken, and I would love to use it again for wings before grilling them. Swap in breast for thighs if you prefer white meat, and cook accordingly. I served the chicken alongside some sautéed spinach, which I also picked up from the farmer’s market that morning. 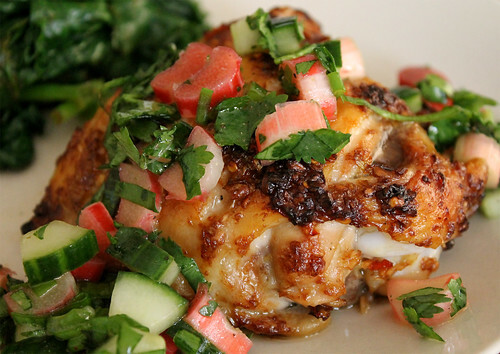 You can find the recipe for Spicy Chicken Thighs with Rhubarb-Cucumber Salsa here, or in the April 2012 issue of Bon Appétit.